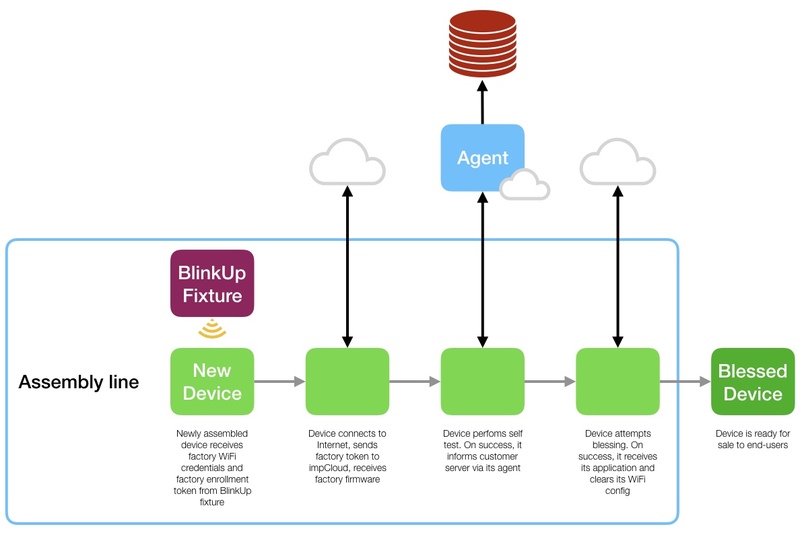 Electric Imp‘s Connected Factory Process simply involves connecting each newly assembled device to the Internet in order to receive the code that tests the device and then binds it to the application that it will run in the field. The device is now ready for sale. The Connected Factory Process is straightforward. You can even run it as-is in the lab to check it before you set up in the factory. It is highly suited to automation and to integration into an existing assembly line, whatever its size. All you need are one or more hardware units dedicated to supplying newly assembled devices with local network access credentials and the token which identifies each one as a unit for testing. Configuration uses BlinkUp™, Electric Imp’s patented optical data transmission process. The configuration units are called BlinkUp Fixtures. They are themselves imp enabled, so they can take full advantage of all the device and agent capabilities that the Platform has to offer. For example, a device under test can send its unique ID and MAC address to its agent, which relays the data to your server for registration. It also tells the BlinkUp Fixture’s agent, which passes the data to the fixture itself. The fixture has been set up to drive a laser etching station that now writes the original device’s ID and MAC address onto the device’s casing. The code that BlinkUp Fixtures run is called factory firmware. The devices they configure run the same factory firmware. You develop code branches in your factory firmware for each of these hardware types and choose the correct branch at runtime. Electric Imp has complete off-the-shelf factory firmware for you to customize for your fixtures, product and factory flow. The final stage of the Connected Factory Process takes place when the factory firmware blesses the newly assembled device. It is now formally a product and by default receives its application so that it’s ready when an end-user powers it up. It will not run the factory firmware again.